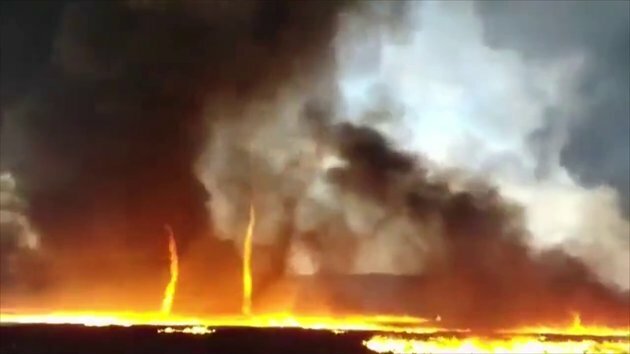 Firefighters captured this incredible 'firenado' while tackling a blaze at a factory in South Derbyshire. Members of the Leicestershire Fire and Rescue Service were responding to the incident on Occupation Lane on Tuesday afternoon, the Derby Telegraph reports . Footage shows how a mesmerising tower of fire rose more than 50 feet in the air as swirling smoke billows in the background. Nearby residents were told to keep their windows closed after 60ft-high flames created plumes of thick black smoke which could be seen up to 26 miles away in Nottingham. Leicestershire Fire and Rescue Service from the Ashby station posted the incident to their Facebook page , and wrote: "Whilst we were firefighting at Occupational Lane we witnessed a firenado or a fire whirl it's created as cool air enters the top of the hot air causing a swirl similar to how a tornado is formed. A good and recent English video.